The NBA is arguably one of the easiest sports to project however because of this it is an extremely reactive sport, meaning when we get information it’s important that we know how to react. In the NBA injury updates are poorly regulated therefore we are often left waiting around for news we may not even get in time. NBA DFS is one of the best sweats out there but it can also be one of the most stressful. We can help make your experience better and give you the edge you need to compete. In addition to providing written content to help you build your daily fantasy teams, we also provide live video streams for our subscribers. 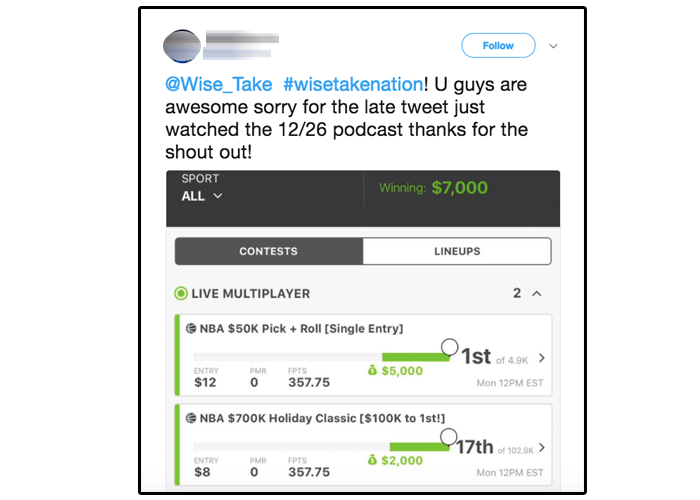 While we offer free first look podcasts, our private streams or “Wise Streams” are done after our experts and analysts have done their full research. Our experts and analysts provide articles to help you build your daily fantasy sports lineups. We provide articles to help you play in Cash Games and GPPs, we also provide the expert poll in which a few of our analysts answer some key questions pertaining to the slate. 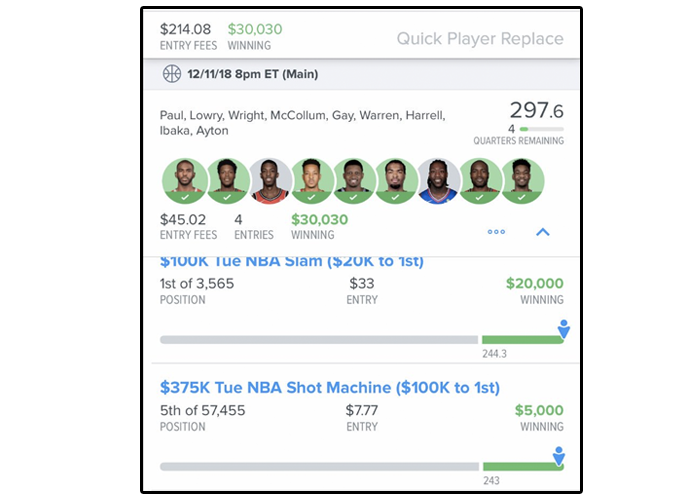 Our members with monthly memberships or higher will get access to our slack chat where they can breakdown the slates with other members and our DFS experts. The slack chat also has automatic news feeds to keep everyone up to date with the latest on injuries and other slate relevant news. NOTE: Slack Chat is only available for monthly memberships or higher. Day passes and one week passes do not get slack access. We provide Cheat Sheets for FanDuel & DraftKings with key players in each price tier including highlighted players to indicate which players are favored in which contents (Cash Games or GPPs). Use these when you’re looking to save time and quickly build teams. NOTE: NBA Cheat Sheets are only available on main slates with five games or more. We provide our own NBA Projections ranking each player by projected point per dollar value. Our projections are updated throughout the day based on injuries and other news. The projections are downloadable into a CSV where you can view them and sort them on other spreadsheet software such as excel. CK013 writes the NBA GPP Core plays article in which he writes up the players he has the highest exposures to. CK also hosts most of the NBA DFS Podcasts as well as the NBA Wise Streams. CK is ranked in the top 800 out of over 45,000 overall and in the top 500 in NBA out of 27,000 DFS players on RotoGrinders.com. Paulie D creates the NBA Cheat Sheets for FanDuel & DraftKings. Paulie can also be found on some of the NBA DFS Podcasts as well as most of the NBA Wise Streams. Paulie D is a former FanDuel live finalist and is currently ranked in the top 500 in NBA out of over 27,000 DFS players on RotoGrinders.com. 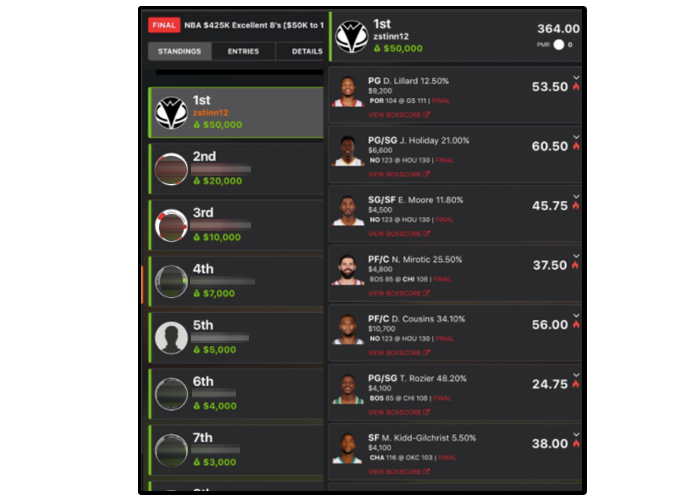 CashinDFS writes some of the NBA GPP Breakdown articles in which he gives his favorite GPP plays of the night. Cash is a popular podcast personality and makes appearances on the Wise Stream weekly. 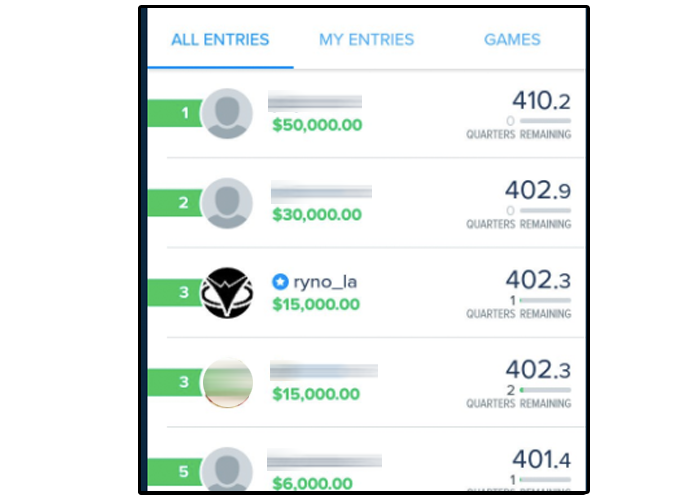 CashinDFS is a former FanDuel live finalist and is a sports nut who plays just about everything. Stevie Brown is a high volume cash game grinder who writes our cash articles on the weekends as well as appearing on some podcasts. He currently has an 80.84% H2H win percentage with a total 121% ROI. 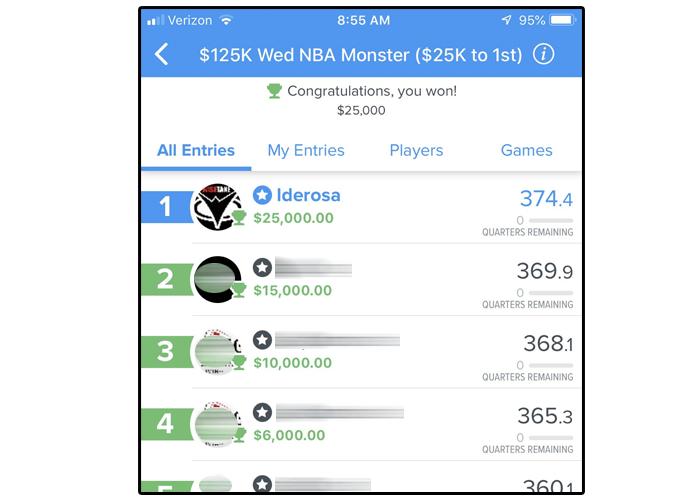 ThunderDan loves writing about NBA DFS and engaging with readers and members in slack chat about their favorite plays. Dan is currently ranked in the top 350 out of 14,800 people in the RotoGrinders.com Fly-Weight divison. 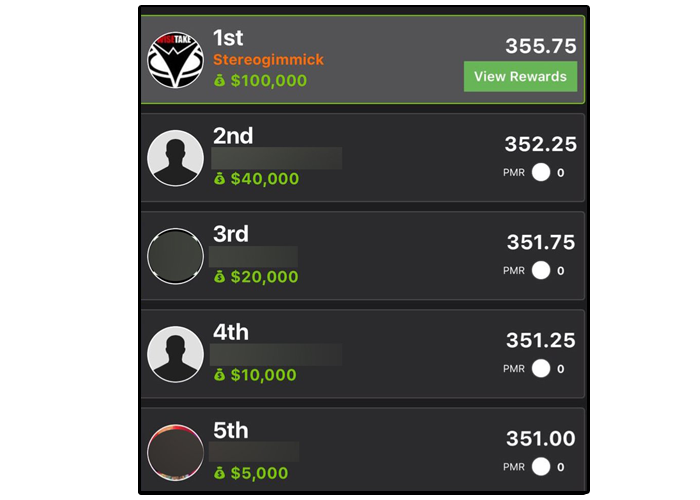 Bkborn8315 is a sports and DFS addict who has been writing our cash article for a 2 seasons now. Aside from cash games BK plays a ton of GPPs on a nightly bases and has come in 1st place in GPP contests with as many 23,000 players. $100,000 screenshot from a WiseTake member. $50,000 screenshot from a WiseTake member. $30,000 screenshot from a WiseTake member. $25,000 screenshot from a WiseTake member. $15,000 screenshot from a WiseTake member. $7,000 screenshot from a WiseTake member. Get the NBA DFS Season Pass and save! Get a day pass to try us out!